In August 2013 a group of SCAD patients attended a meeting at the Leicester Cardiovascular Biomedical Research Unit (LCBRU) to meet members of the team planning a research project into SCAD. They also met Dr Gulati who is involved with the research at the Mayo Clinic in the US. Dr David Adlam, who is leading the UK research project, kicked off the meeting, followed by Dr Batty giving a round-up of what the LCBRU does. Public-patient engagement is critical to the BRU’s success in terms of research and the team welcomed the pro-active involvement of SCAD patients. Plans were revealed for the SCAD project to be featured one of the public open days hosted by the LCBRU and encouraged the group to get involved. Click here to read the story about patient involvement in the open day. The SCAD project is developing a web portal to provide information and support to SCAD patients and their family and friends as well as medical professionals. The portal was shown to the group and further plans were discussed. Dr Gulati discussed the SCAD research project at the Mayo Clinic, which currently has 350 patients, and what’s known about SCAD so far. He said cardiologists expect to see a tear or flap in an artery wall but not all SCAD events result in this presentation; many are caused by a haematoma (bruise). Dr Gulati believes this contributes to missed diagnoses. He also said the number of SCAD cases currently known about are the “tip of the iceberg” and estimated that the real number could be 10 times greater or more. 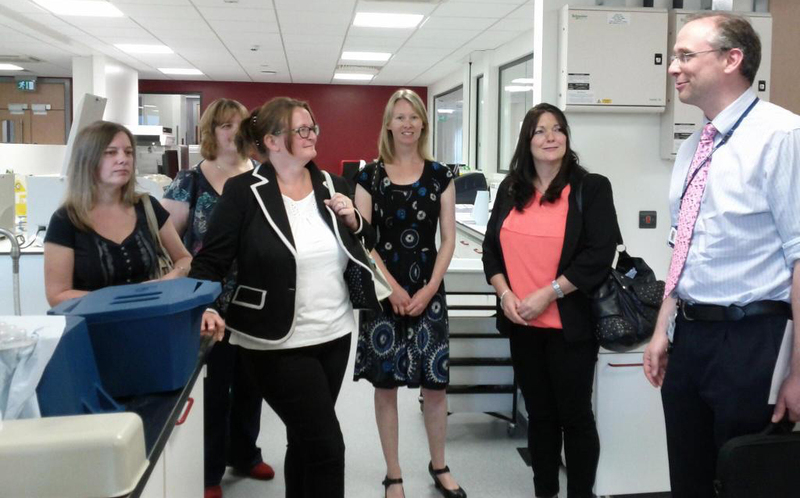 In July 2013 some SCAD patients visited the Leicester Cardiovascular Biomedical Research Unit (BRU). The group shared their stories with Dr David Adlam and his team and discussed the progress being made towards the SCAD research project. They also discussed ideas for a website to support the research with the BRU’s informatics team. The site would enable SCAD patients to register for the research and find out more information about the condition. Plans also included areas where medical professionals could find out more about SCAD. Dr Adlam (pictured right) gave the group a tour around the BRU’s facilities.